Monarchs seem to be accumulating along the dunes of Cape May Point on this sunny, chilly, and breezy morning. Check the more sheltered dune crossovers on the eastern side of Cape May Point -- the ends of Lehigh, Whilldin, Coral, or South Lake. You should find some in small clusters in the pine and juniper trees while others are feeding on seaside goldenrod, as illustrated below. 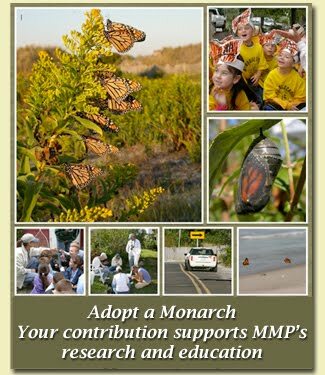 We plan to check Stone Harbor Point and Cape May Point this afternoon to see if these northwest winds deliver another big batch of monarchs to us. Count on us to report back at day's end.